Build a voice controlled smart speaker these days and it's one thing: an Amazon Echo rival. And with Microsoft opening up Cortana to third party hardware companies, the first device - a Harman Kardon speaker which we now know is named Invoke - and the comparison is seriously easy to make. Shortly after being leaked, the speaker is now official. The Invoke will have 360-degree sound and Skype support so that you can make all the calls you need to landlines, cell phones and other Skype-enabled devices. The Invoke will launch in Fall 2017 only in the US. There is no word on pricing yet, but that could come at Microsoft's Build conference in a couple of days. 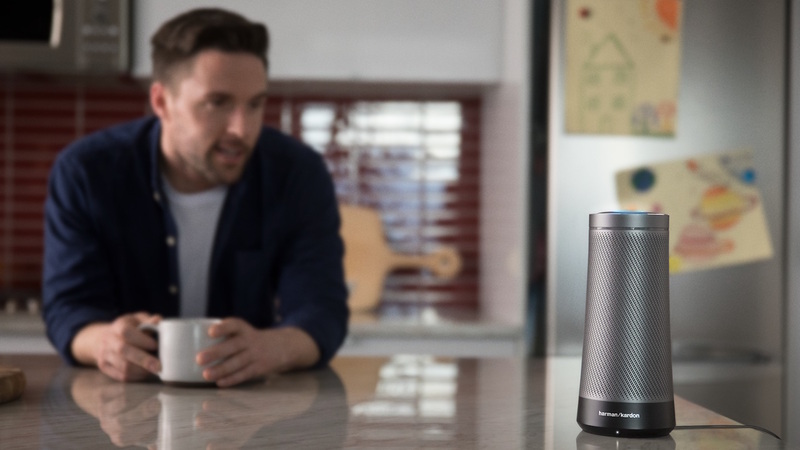 The Harman Kardon made cylindrical speaker is voice controlled with Microsoft's AI assistant Cortana, taking the place of Amazon's Alexa in the setup. The Invoke itself looks a lot like the Echo, perhaps a little classier with what looks like a matte metallic cylinder, the Harman Kardan branding and a blue glowing light. It also comes in two colors, a more traditional silver and a dark, almost gunmetal black. Developers will be able to create Cortana 'Skills' - we told you it sounded familiar - so that the speaker can control things like Spotify and Hue light bulbs. Microsoft is even making it easy for devs to port over Amazon Skills to Cortana via its Bot Framework. The Skills Kit launched in February so devs have had plenty of time. The only further detail is that the Harman speaker will work with third party services and that we should expect more Cortana powered speakers, appliances and connected cars via the Cortana SDK. The latest player in the voice controlled smart home is the Google Home speaker which reviewed well when we tested it, thanks in part to Google's years refining Voice. What's also interesting in this new partnership is that Harman is now owned by Samsung. You know, Samsung which has its own SmartThings platform. As for Amazon, it has already announced partnerships with the likes of Hyundai's in-car apps and we're expecting an Amazon Echo 2 this year, complete with a touchscreen. Before the Cortana announcements, the rumours had indicated Microsoft would bring PCs into the smart home equation with a Home Hub interface. Even with the new leaks, this might still be in the works. Stay tuned for official confirmation when Microsoft Build kicks off this week. Who would you rather chat to? Alexa, Cortana or Google Voice?